Choose from 3 caster types! A - Polyurethane 5" casters. 2,000-lb. capacity. B - Mold-on rubber 8" casters. 2,000-lb. capacity. C - Pneumatic 8" casters. 1,200-lb. capacity. 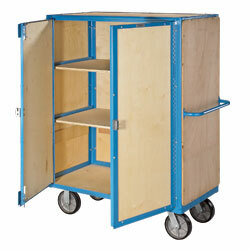 Capacities are for a set of 4 casters (per truck). Among the strongest in the industry, premium trucks are built entirely of close-tolerance components. Solid wood doors and sides. Deck is 3/4" thick layered wood panel mounted flush into an all-welded, 1/8" x 1-1/2" angle iron frame. Each upper shelf supports 400 lbs. Doors open on full-length piano hinges and include high-security, hardened steel padlock hasps. Padlocks not included. Color: blue. SPECIFY CASTERS: A - 5" polyurethane, B - 8" mold-on rubber, C - 8" pneumatic. IN STOCK. YM-2985A 315	 2000	 3	 17-1/2"	 48" x 24"	 63"
YM-2986A 341	 2000	 3	 17-1/2"	 48" x 30"	 63"
YM-2987A 389	 2000	 3	 17-1/2"	 60" x 30"	 63"
YM-2987B 410	 2000	 3	 17-1/2"	 60" x 30"	 66"
YM-2987C 404	 1200	 3	 17-1/2"	 60" x 30"	 66"
YM-2985B 330	 2000	 3	 17-1/2"	 48" x 24"	 66"
YM-2986B 356	 2000	 3	 17-1/2"	 48" x 30"	 66"
YM-2985C 327	 1200	 3	 17-1/2"	 48" x 24"	 66"
YM-2986C 353	 1200	 3	 17-1/2"	 48" x 30"	 66"
YM-2982A 334	 2000	 3	 17-1/2"	 48" x 24"	 63"
YM-2983A 360	 2000	 3	 17-1/2"	 48" x 30"	 63"
YM-2984A 394	 2000	 3	 17-1/2"	 60" x 30"	 63"
YM-2982B 355	 2000	 3	 17-1/2"	 48" x 24"	 66"
YM-2983B 381	 2000	 3	 17-1/2"	 48" x 30"	 66"
YM-2984B 415	 2000	 3	 17-1/2"	 60" x 30"	 66"
YM-2982C 349	 1200	 3	 17-1/2"	 48" x 24"	 66"
YM-2983C 375	 1200	 3	 17-1/2"	 48" x 30"	 66"
YM-2984C 409	 1200	 3	 17-1/2"	 60" x 30"	 66"